The concrete planters around the Hirshhorn Museum helped slow a wayward truck that crashed into the museum Monday night. This incident was not a deliberate attempt to attack the building; it was a totally freak incident which had never happened before. Although this will probably spur efforts to increase the security measures around the building, it really should be a catalyst for rethinking the purpose and even the need for these ugly and ineffective barriers entirely. Not just here, but in most locations in DC. Post 9/11, jersey barriers, concrete planters, bollards and other "security" measures sprung up like weeds everywhere in Washington, DC. First they were located around places like the White House and Capitol, but before long they started surrounding virtually every building that housed a federal worker or was owned by some level of government. By now, the totality of those barriers must cover scores of acres of valuable sidewalk real estate. They create an unwelcome atmosphere to pedestrians, forcing them to weave and sometimes wait for others to make room just to walk to and from their destinations. Most of them are unsightly at best and downright ugly at worst. The open space and welcomeness of virtually every outdoor space in the core of DC has been degraded. It's understandable that we put measures in place to protect the White House, Capitol and other key potential targets. But, HELLO!, the Hirshhorn is not a target. It is not on any terrorist's list of buildings. Shoot, most people have never even heard of it. When out-of-towners come visit, and I recommend it to them, never once has anyone heard of it before. I even know people who live here in DC who haven't heard of it. It's not on the list. Neither is the Renwick, the Phillips Collection, the Freer Gallery, etc. The Guggenheim Museum in New York City is much more iconic than the Hirshhorn. A quick check of street view in Google shows no barriers protecting the museum entrance from the street. Pedestrians may walk easily and directly into the building without any impedance from barriers of some sort. 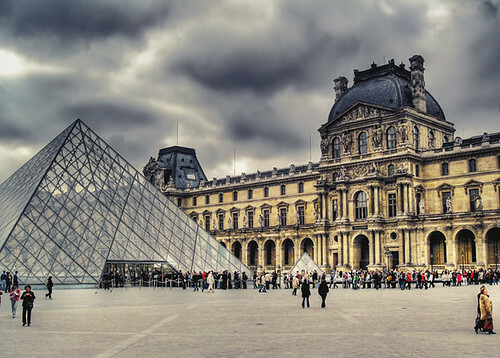 Likewise with the Philadelphia Museum of Art, the Chicago Art Institute, The Metropolitan Museum of Art, and, for that matter, the most famous art museum in the world--the Louvre in Paris. What are we afraid of that they are not? Washington DC is the capital of the United States, supposedly the beacon of freedom in the world. Yet in our capital, the simple freedom of being able to walk on sidewalks and enter public buildings unaccosted has been taken away. Each little step in this direction chips away at the free society that supposedly reflect our nation's fundamental values (see recent post re: overhyped security on Earth Day). Linda St. Thomas, a Smithsonian spokesperson said that the planters did what they were supposed to do. What?!? What exactly is it they are supposed to do? Were they supposed to "slow" an out-of-control truck so that it still struck the building, causing damage, but maybe not as much? Was that their intent when they put them in? That's laughable. No, they were put there to protect the building from intentional attack; it's just coincidental that they happened to slow the truck down a bit--not the intention of the barriers at all. In fact, now it's obvious that these barriers all around town are just a charade, because they wouldn't stop a determined terrorist anyway--they can just be pushed aside by a medium-sized truck. The point, though, is not that we need to bolt them down or make them heavier. It's that they don't really need to be there at all, because they are an illusion--protecting against an imaginary threat. Here's a thought experiment. Imagine the truck had its accident a mile or two away in a commercial corridor--running into a storefront. Would the reaction be to suddenly install some sort of barriers along the street to protect against the rare wayward vehicle? Would we put up bollards or barriers along every street? No. The owner would file a claim with its insurance company, fix up the store, and life would go on as before, with the sidewalks adjoining the street as always. The Hirshhorn is an art and sculpture museum. It celebrates the aesthetic of the visual. The building itself--love it or hate it--is a piece of visual art. It is surrounded by sculptures. If anyone should understand the negative visual impact of these ridiculous planters (even worse are the jersey barriers on the Jefferson Dr. side of the museum), it should be the curators at this museum. Ms. St. Thomas also said (as reported in the Washington Post), "Maybe one piece of good that could come out of this is a little more funding and little more thought into where we really do need security and how we do that correctly and appropriately,"
Yes, a little more thought, thank you. And perhaps a little less funding. Like let's get rid of them entirely in about 90% of their locations around DC. They are unnecessary; evidently they don't even function to protect the buildings as intended; they rob us all of valuable space; they are ugly, visual clutter; they run counter to our nation's values; and they degrade the experience of citizens of and visitors to our nation's capital.